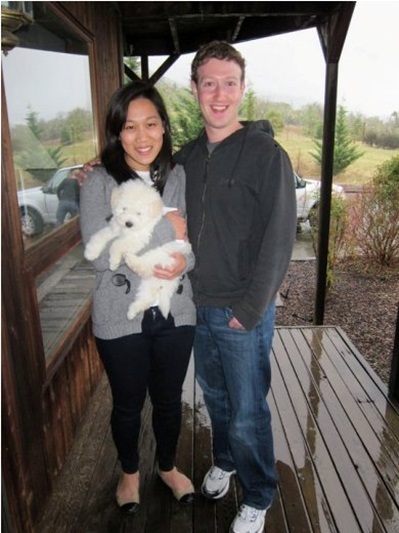 PALO ALTO, California — Facebook founder and CEO Mark Zuckerberg updated his status to "married" on Saturday. Zuckerberg and 27-year-old Priscilla Chan tied the knot at a small ceremony at his Palo Alto, Calif., home, capping a busy week for the couple. The couple met at Harvard and have been together for more than nine years. A source authorized by the couple to speak said Zuckerberg designed the ring featuring "a very simple ruby." The ceremony took place in Zuckerberg's backyard before fewer than 100 guests, who all thought they were there to celebrate Chan's graduation. Even after the IPO, Zuckerberg remains Facebook's single largest shareholder, with 503.6 million shares. And he controls the company with 56 percent of its voting stock. The site, which was born in a dorm room eight years ago, has grown into a worldwide network of almost a billion people. Zuckerberg founded Facebook at Harvard in 2004. He was named as Time's Person of the Year in 2010, at age 26. Zuckerberg grew up in Dobbs Ferry, N.Y.